We provide a working document that serves as a road map of care. Our Life Care Plans are built on sound rehabilitation principles and are individually tailored with the dual goals in mind of minimizing complications and maximizing functional potential for the individual. A Life Care Plan, by definition, is a dynamic document based upon published standards of practice, comprehensive assessment, data analysis and research which provides an organized, concise plan for current and future needs with associated cost for individuals who have experienced catastrophic injury or have chronic health care needs. 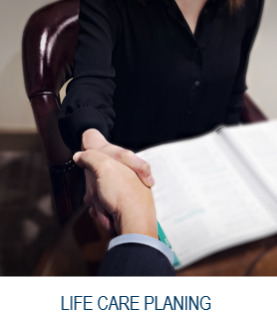 Life Care Plans are prepared by certified life care planners and are based on comprehensive assessment, collaboration as appropriate with the treatment and rehabilitation team, extensive cost research into resources local to the client, clinical practice guidelines and rehabilitation nursing knowledge and experience. A "real world" approach is used with the dual goals of maximum functional independence and minimizing complications. A Life Care Plan is a road map for the future which will help clients, families, providers, attorneys, insurance adjusters and other interested parties navigate the too often choppy waters of today's health care and will provide quantification of future medical expenses in a concise and comprehensive manner. Our Life Care Plans have been admitted into evidence in State and Federal courts across the nation. Medical Cost Projection reports are used when a full catastrophic life care plan is not needed, but there has been future care recommended such as a surgery or future course of pain management treatment. Medical cost projection reports are prepared by registered nurses who are certified life care planners using life care planning methodology, including appropriate coding and costing resources. Our medical cost projections are performed by certified life care planners who have expertise with coding and costing methodology. 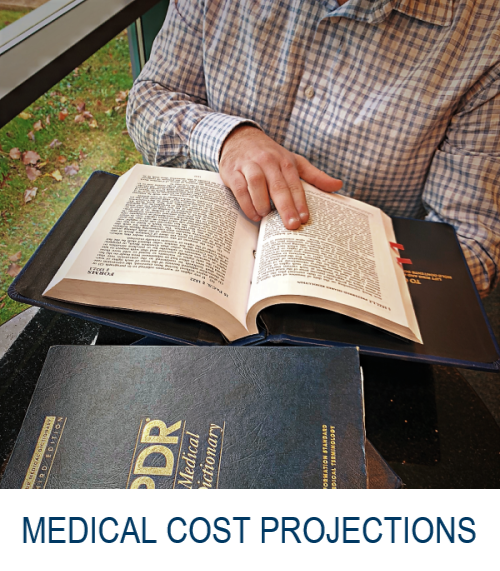 A medical cost projection is a targeted report which may be limited to a future course of treatment including future surgery, course of pain management procedures, and ongoing medications therapies based on the recommendations of treating and/or consulting physicians. All likely costs are considered, including physician fees, anesthesia charges, hospital charges, rehabilitation charges, home health care charges, medications, diagnostics, and durable medical equipment associated with the proposed medical procedures based on decades of nurse case management and life care planning expertise. Our bill review team includes certified coders, experienced nurse case managers, and certified life care planners. Fills the increasing need for expertise in determining whether the past bills related to a motor vehicle accident or work-related third-party case are fair and reasonable. 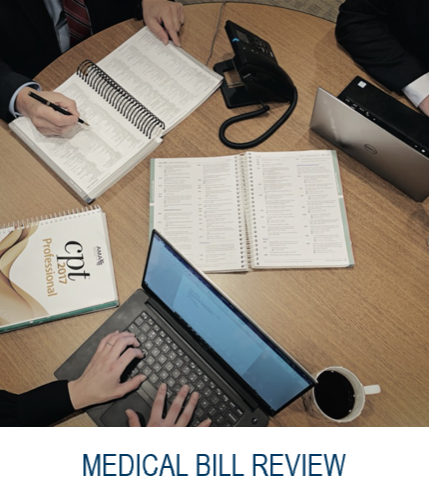 Bill reviews can be standalone reports or can be included in a medical cost projection or life care plan report. Coordination of care for individuals with catastrophic injury or work-related injury for insurance carriers. Proactive case management to include contact with the client, family, physicians and other providers, the work place, and insurance adjusters. Timely interventions to facilitate the best outcomes. Services for individuals and families include care management services to aid in locating resources and assist with home care and placement options. Services to individuals, families, elder attorneys, and financial planners include care management services to aid in locating resources and assist with home care and placement options. Services to individuals, families, elder attorneys, and financial planners also include researching treatment options in cases of new diagnoses and chronic illness, physician appointment attendance for individuals with new diagnoses, special needs of the geriatric population, as well as hospital attendance, providing the eyes and ears of a skilled professional nurse. Medical summaries and chronologies prepared by experienced legal nurse consultants. Access to expert physicians, nurses, and other health care providers for your consulting needs.